Reading Is Fundamental, Honolulu, Inc. (RIF-Honolulu) is a 501(c)(3) non-profit organization that serves children in areas on Oahu. • Encourages a love of reading through book ownership. 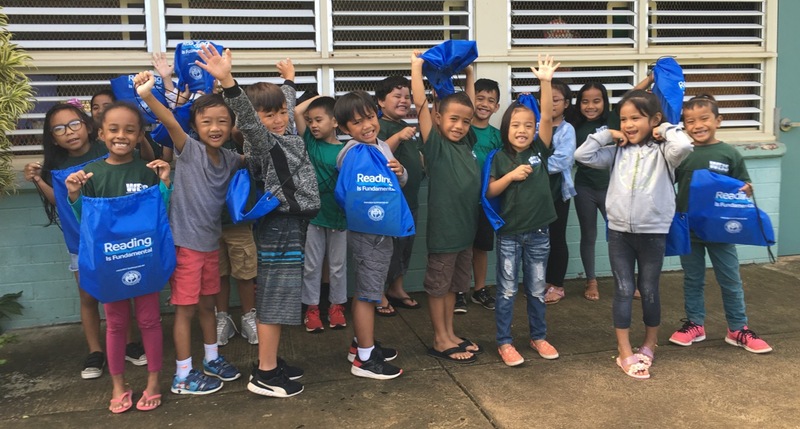 • Provides 16,000 books a year to K-3 students in under-resourced communities on Oahu. • Is staffed entirely by volunteers. 100% of all contributions to RIF-Honolulu are used exclusively for our Oahu children’s reading program. Many years ago, Uncle Eldean Kukahiko lived across the street from Kahalu’u Elementary School. He attended the school as a boy, and through the years his family stayed close to the school, and his grandchildren also attended. Uncle Eldean was a pastor and kupuna at the school, befriending both students and teachers, as well as teaching ukulele. Several years ago a large monkey pod tree, planted in the 1960s on the campus, blew over during a storm. Uncle Eldean had an idea. He got permission from the city to harvest the tree and use the wood. The school’s parent community helped him find a wood worker who sawed and milled the wood into planks. Uncle Eldean decided to teach his best friend, Peter Fields, how to turn the planks into tables and benches. This was a lucky decision, because half-way through the project, Uncle Eldean passed away. The tables, benches, and poi boards were completed by Peter Fields at the Parks and Recreation area in Kahalu’u. 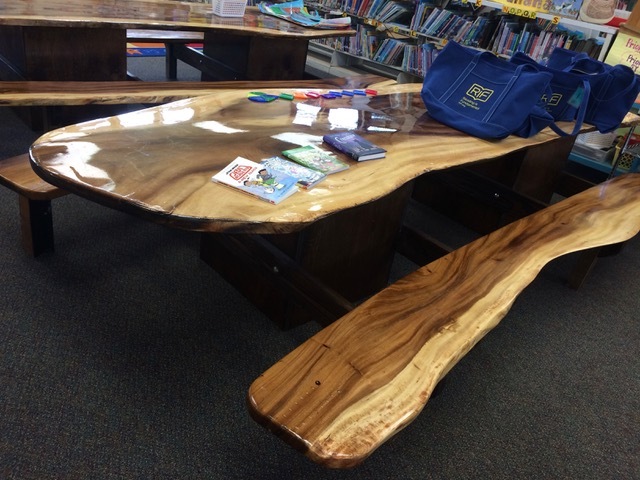 Now, two lovely long tables and four benches grace the Kahalu’u Elementary School Library with their beautiful shapes and rich grain. 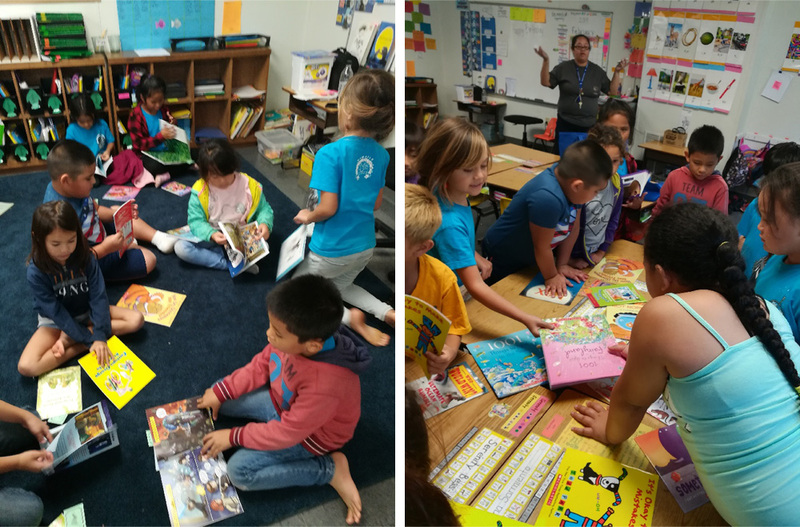 The students sit at them every day, and the RIF volunteers especially like coming to Kahalu’u Elementary to sit at the tables, and to look over books and enjoy the delicious snacks provided by Ms. Kobashigawa and Mr. Nakaoka. Students in every grade pound poi on the beautiful monkey pod poi boards twice each year, led by Uncle Eldean’s wife, Aunty Darlene. Through a partnership with Panda Express and their Panda Cares Foundation, we will be distributing three free books to the first grade students in our 16 schools. These books will be in addition to their regular RIF books, so the first grade students will receive six books this year! 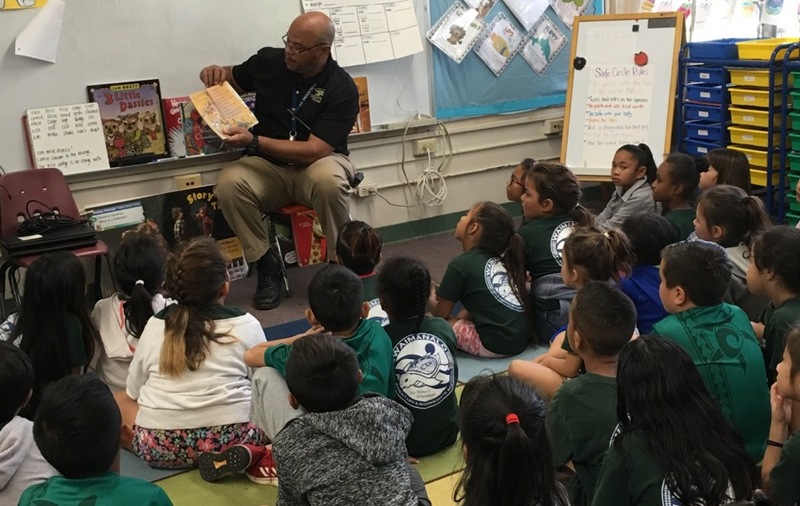 Waimanalo Elementary had a special guest reader for their event — Principal Mr. Noel Richardson!